The words “Hawaii” and “beaches” have become synonymous, which just makes sense since this Pacific island chain is home to a mother lode of these tropical beauties. That’s awesome news for families targeting a Hawaiian Island vacation to spend time frolicking in the surf. While some beaches are primo for swimming, others lure those into tide pooling, snorkeling, boogie-boarding and surfing. Especially when seeking a family-friendly beach, always bear in mind that conditions may vary with the season. And simply because one is noted for a particular activity, it’s best to confirm that the beach has something to engage a range of ages and ability levels. Rimmed with 30 miles of beaches along its 112-mile coastline, Oahu caters sand enthusiasts with some 60 beach parks—with the bulk featuring public facilities. On Oahu’s sunny south shore, the world-famous urban resort of Waikiki was once a playground for Hawaiian royalty with its ocean action amiable for all ages. While many criticize the beach for being “too crowded with tourists,” it remains a multi-generational magnet because of its reliable conditions, multiple diversions, easy access and natural beauty. Stretching one-half mile wide by two miles long, Waikiki Beach is a collection of contiguous beaches that includes Fort DeRussy Beach, Kuhio Beach and Queen’s Surf Beach. 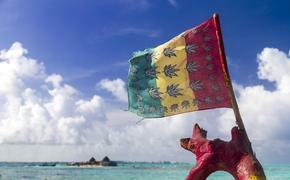 While each has distinctive appeal, all are hot spots for sunbathing, snorkeling, swimming and beginner level surfing. Waikiki’s calm waters are perfect for a surfing lesson with the Waikiki Beach Boys that perpetuate Duke Kahanamoku’s legacy by teaching visitors the skills of Hawaii’s ocean sports icon. Another popular pick with the Beach Boys is an outrigger ride with steersmen maneuvering these canoes to catch waves. Other top Oahu beaches for family-friendly fun include urban Ala Moana Beach Park just outside of Waikiki, Kailua Beach Park and Lanikai Beach Park on the Windward Coast, the North Shore’s Waimea Bay (summer) and the crescent beaches tucked within the Leeward Coast’s Ko Olina Resort. With 90 miles of coastline, Kauai is home to 43 white sand beaches. In fact, the island features more beaches per square mile than any of the other major Hawaiian Islands. 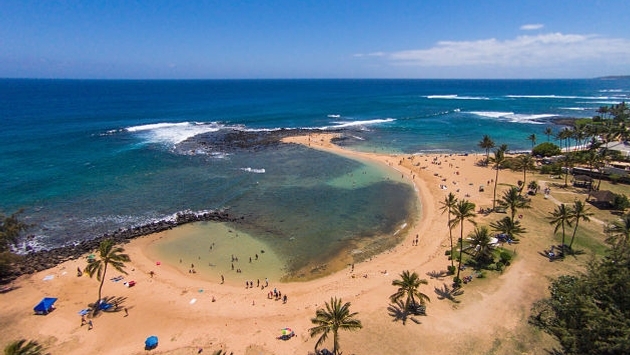 With crystal clear waters, gorgeous sand, and occasional Hawaiian monk seal and green sea turtle appearances, Poipu Beach Park defines Kauai’s laid-back south shore beach scene. As a family-friendly bonus, Mother Nature blessed this iconic Kauai beach with a natural wading pool that allows toddlers and youngsters to splash the day away. Snorkeling is also top with the variety of colorful marine life that includes Hawaii’s state fish, the Humuhumunukunukuapuaa. While this isn’t one of those “off the radar” escapes, it’s popular for a reason. Count on lifeguards, picnic facilities, showers and pavilions to make the adventure more convenient. Other favorite family beaches include Salt Pond Beach Park near Hanapepe and Lydgate Beach Park in Wailua. The latter is considered one of the best spots for first time snorkelers thanks to a natural lagoon protected from the ocean by a lava rock wall. While the Big Island of Hawaii is larger than all of the other main Hawaiian islands combined, it’s limited on those postcard image white sand beaches ringing its sister islands. Thank Madame Pele for that. Hawaii’s goddess of fire is responsible for the black lava landscape that dominates much of this 4,028-square-mile wonder that continues to grow. The island’s largest white sand beach, Hapuna Beach Park Recreation Area is consistently rated on numerous “Top Ten Beaches” lists. This popular half-mile stretch gracing the South Kohala Coast appeals with crystalline surf for avid swimmers and snorkelers, consistent small wave action for body boarders and wide sand dunes for lazing in the sun. Since the beach is so wide, it often doesn’t seem crowded even when populated by plenty of sand fanatics. Beauty aside, you’ll also enjoy ample parking, picnic areas, food vendors, restrooms and showers. For more beach fun, check out popular Kahaluu Beach for snorkeling just south of Kailua-Kona Town and North Kohala’s Samuel Spencer Beach Park with its protected outside reef that typically allows for calm swimming and snorkeling. Maui’s 120 miles of coastline unfold with more than 30 miles of beautiful beaches ranging in colors from red and white to black. Depending on your family’s interests, you can tap into gems that dazzle with surfing as well as remarkable finds to simply sunbathe, swim and snorkel. Hauling in honors as the “Best American Beach in 2016” by BeachUSA, West Maui’s signature just north of Lahaina Town wows with three miles of white sand fringed by gentle waters. This is an epic Hawaii setting for beginner surfing, stand up paddling and swimming. That explains why the Kaanapali Beach Resort became the first “neighbor island” master planned community when it hit this stunning shore in the early 1960s. Sure, there are ample hotels and vacation condominiums lining the stunning stretch of sand. But its expanse means you’re not stacked on top of others. There’s plenty of room to spread out on the beach and in the inviting waters. After a day of ocean action, families should extend the bliss through sunset as a diver plunges 40 feet into the surf from Black Rock (Puu Kekaa) that fronts the Sheraton Maui. Also check out D.T. Fleming Beach Park and Kapalua Beach (Old Fleming Beach) north of Kaanapali, the natural pool surrounded by a lava rock wall at Launiupoko Beach Park just south of Lahaina, and Kihei’s Kamaole Beach Park – typically referred to as Kam 1, Kam 2 and Kam 3. Lanai offers 18 miles of shoreline with a handful of beautiful beaches. Fronting Hulopoe Bay with the Four Seasons Resort Lanai as a backdrop, this sweeping pearl-white sand shoreline is Lanai’s most popular and most accessible beach. With fantastic snorkeling, tide pools exploring and hiking to nearby Puu Pehe (Sweetheart Rock), the south shore haven features picnic tables, barbecue grills, restrooms and showers. Among its coveted highlights are the large tide pools at the eastern side of the bay. Carved out of volcanic rock, these gems are naturally protected – meaning the waters remain calm for discovering hermit crab, opihi (limpet) and sea stars.